The host was beyond helpful. She was a pleasure to deal with. The location was perfect, a quick walk to many of the tourist spots. Nice apartment, awesome wine bar right across the street and brunch cafe around the corner perfect for breakfast. Apartment was well furnished and comfortable. The Host, Carla is very nice and helpful. The place is spacious and comfortable. The location is excellent! Wonderful staff, very clean rooms, building was very secure, location was great. Very walkable to many places in central Lisbon and close to tram pickups for Belem. Inez the hostess was so sweet and helpful! The apartment was adorable and clean and comfy and quiet., and quite roomy. We travel alot and this place was a true gem. Great location that also had a nice working kitchen. She had coffee, a bottle of wine and cookies waiting in the apartment, which I always think is a nice touch. Helpful reception. nice welcome wine and cookies. Nice and responsive staff. On arrival we had a bottle of wine, biscuits and coffee supplied. So while settling in having a coffee was great. Laundry powder and dishwasher tablets also was great (usually having to supply own) receptionist was very helpful even printed out tickets for us that a friend forgot to do. The friendliness of all staff and cleanliness was fantastic. Location to the metro and shopping areas, with local little eateries around just all fantastic. Lock in a great price for Madalena Hermitage – rated 9.5 by recent guests! One of our best sellers in Lisbon! 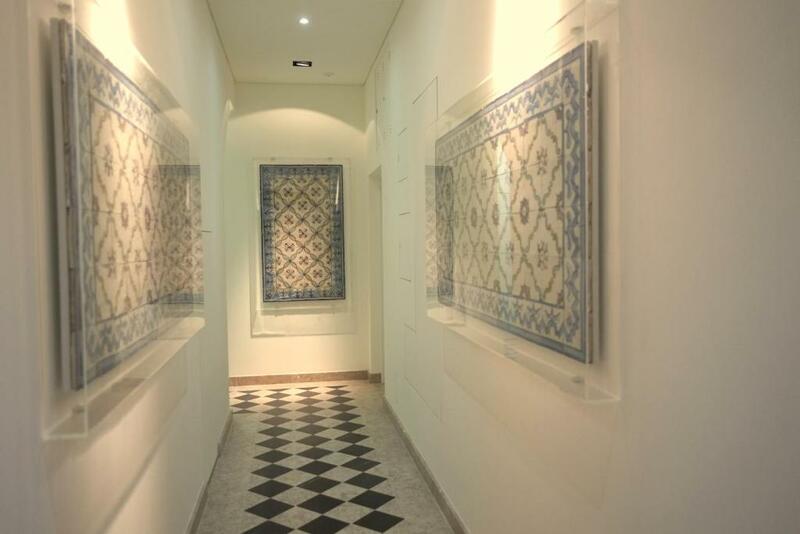 Located in the center of Lisbon, Madalena Hermitage is an 18th-century building offering modern, design apartments. It is only a 2-minute walk to Praça do Comercio and has views of Lisbon Cathedral. The apartments are decorated in pastel colors and have modern kitchens with a dining area. The private bathrooms are stocked with free toiletries. Each is air conditioned and has a satellite TV and free WiFi. Guests can buy groceries for self-catering at the supermarket 500 feet away. Local restaurants and bars are available within a 2-minute walk. The ferry across the River Tagus leaves from Terreiro do Paço Square, 900 feet away, which also has a metro station. The Cais do Sodré‎ Train Station offers connections with Sintra and Cascais and is only 0.6 mi away from the Madalena Hermitage. When would you like to stay at Madalena Hermitage? Offering large windows in the bedrooms, this bright and spacious apartment features a large designer kitchen with a dining table. There is a separate lounge room equipped with an LCD TV and sofa bed, while the private bathroom provides a bath. Some apartments also include a wardrobe. Free WiFi is available. 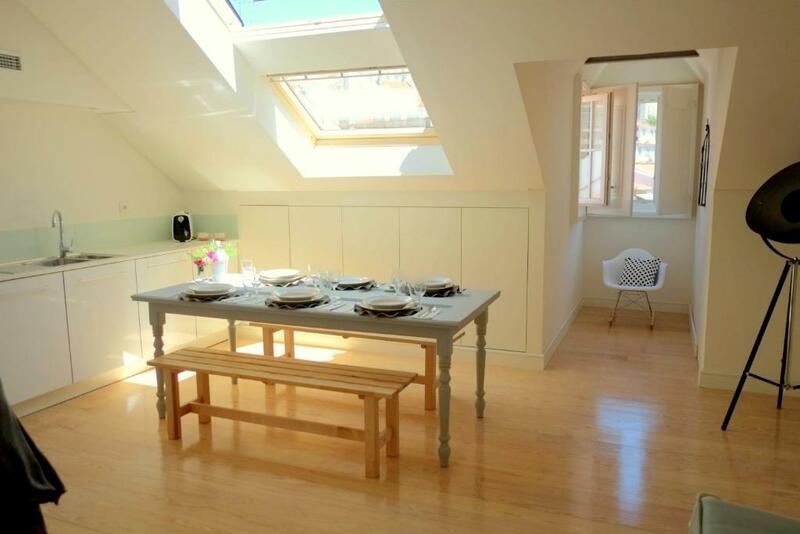 Featuring a large sky-light with views of Lisbon Cathedral, this bright apartment offers free WiFi and has a bedroom equipped with a double bed. The spacious living room includes a dining table, flat-screen TV and a sofa bed that can easily be converted into two separate beds. Adjacent is a kitchenette with a dishwasher and washing machine. The private bathroom includes a shower. 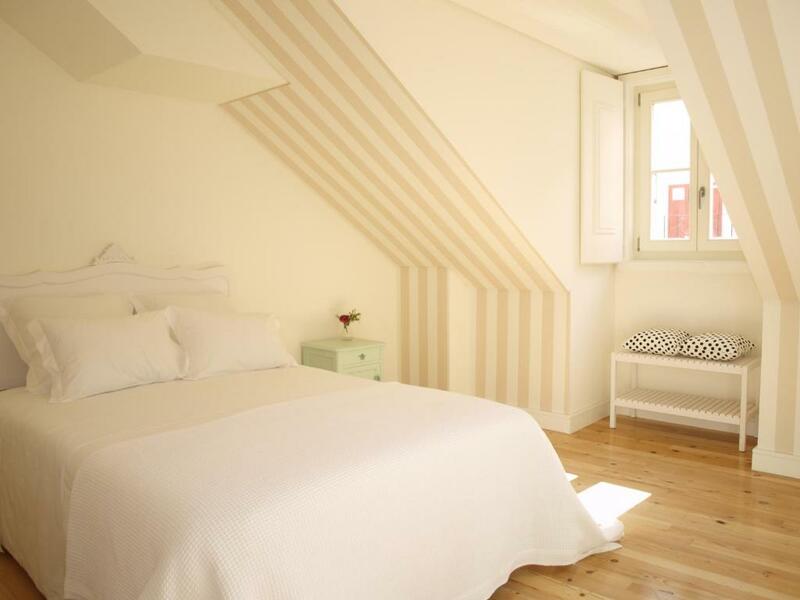 Madalena Hermitage is an 18th-century building that was completely refurbished and that offers you cozy design apartments with soul and a traditional Portuguese ambience. We want you to fell at home so you can expect wooden floors where you can walk barefoot, soundproof windows, comfortable mattress, air conditioner, cable TV and free wifi and amenities. To make your stay as enjoyable as possible we will provide you city insights and recommendations, as well as apartment access codes that allow you check in comfortably even if you arrive late at night. At Madalena Hermitage you will be in one of the best located apartments in Lisbon, right at the city center and within 2 min walking distance from the river and the Lisbon’s main square, Praça do Comércio. This trendy area is popular with artists and musicians and offers a wealth of shops, restaurants, bars and supermarkets. The Lisbon’s Castle and Cathedral are within walking distance and the area is very well served by public transportation like Metro, tram (including the famous “28”), train and boat. We love receiving guests, being able to show them the beauty and magic of our city, make them feel at home. Make them love our city and come back again and again and again. We are located right in the historic center. 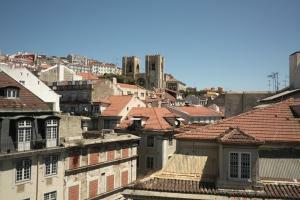 15 minutes walk from the castle and the most famous and typical neighborhood of Lisbon, Alfama. 3 min from the Praça do Comércio, one of the biggest squares in Europe facing the river, the perfect picture. Everything is Walking distance, the most trendy restaurants and the most typical. Just across the street we have a pharmacy, an excellent bakery and 3 min walk, a little grocery store. House Rules Madalena Hermitage takes special requests – add in the next step! Madalena Hermitage accepts these cards and reserves the right to temporarily hold an amount prior to arrival. Please note that guests arriving outside check-in hours must contact the hotel at least a week in advance by email to get the access code. Please note that late check-out is not possible. Please note that cleaning of the apartment is only done prior to check-in and after check-out. Cleaning service is available during the guests' stay, upon request and at an extra cost. Please inform Madalena Hermitage of your expected arrival time in advance. You can use the Special Requests box when booking, or contact the property directly using the contact details in your confirmation. Codes to get in the apartment were sent the day before, so if we arrived after check in we were good. Security features were great. The apartment was in walking distance to the Alfalma district and Fado bars, all popular areas in downtown Lisbon. Trains, the metro, buses, trams, hop on hop off buses were all very close, too. The property was not well marked and we initially couldn’t find it. A quick phone all sorted it out really efficiently. The host was very welcoming and enthusiastic. Great property, large rooms, excellent location, very friendly staff. very nice hosts. beautifel big appartment with all you need, we even cooked dinner one night. very good location - great restaurants just across the street. Nothing to dislike. There was only one bathroom, but this was as advertised. 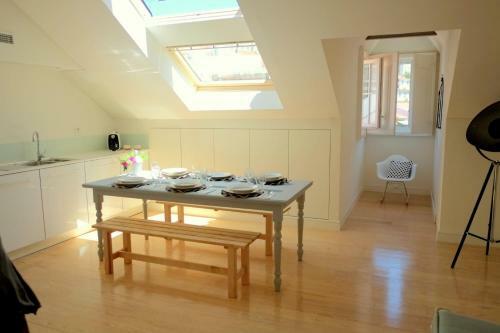 Fantastic property in the heart of the tourist area of Lisbon. All the key attractions were a very short walk away. Even the train station, hop-on hop off bus stops, tram station, lift to the castle area was a very short walk away. Cannot think of a better location to explore Lisbon from. Helpful hosts - always available and ready with suggestions . Apartment was cleaned every two days, which was great. Large and very modern apartment. Lots of cutlery. Fridge and washing machine made life easy. Two levels of security via door codes made it safe and convenient at the same time. There is a lift as well, which would be very convenient for guests with restricted mobility. Lots of cafes, bars and restaurants literally right outside the building. You will not like this place if you’re a light sleeper. The walls are paper thin & the street noises with the garbage trucks in the middle of the night are loud enough to keep you up! Excellent location. Could not be better. Nothing- it was a great stay. Very clean, well maintained and comfortable. Ines was very helpful at check in and we received a warm welcome . The rooms were spacious and we really enjoyed our stay. The wine and biscuits were a nice touch. Highly recommend. Decoration is not my favorite. But every aspects are good. Very good service to store our luggage. Thanks for that! Everyone was so helpful friendly and made us feel so welcome. We were sad to leave and wouldn’t hesitate to stay again. The standards were fantastic and we can’t wait to come back. Thank you so much you are great. Location is prefect. We had a family suite with two bed rooms, kitchen and sitting area. It is good size for 4 member family and very clean. Highly recommend.